Up to this point I haven't been a huge fan of Montblanc, I thought their pens are way overpriced, paying more just for the white 'star' (which is actually the top view of the Montblanc mountain!) on top of your pen. 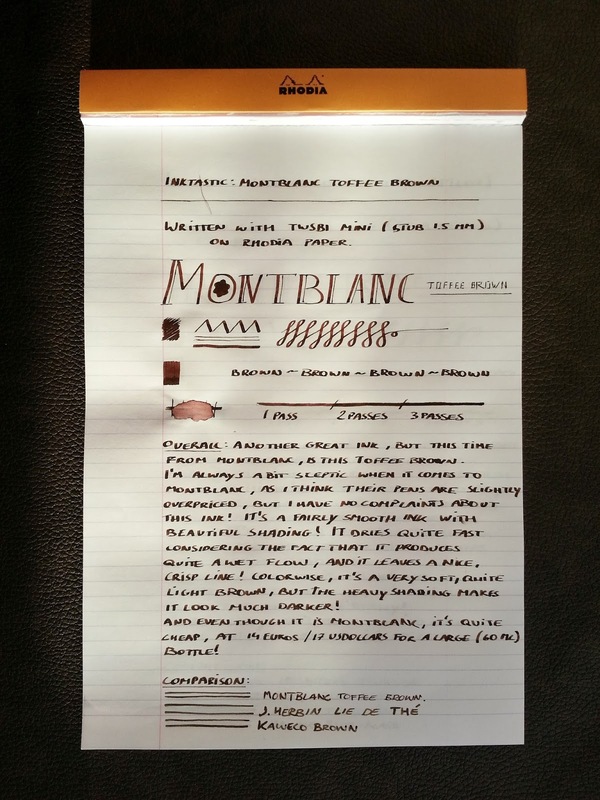 But since I own this Montblanc toffee brown ink, I slightly changed my harsh opinion about Montblanc! As with most inks I buy, I had heard a lot of good things about this ink, so I was already quite confident that this would be a good one. And my expectations where right, I have really enjoyed it with every pen I used it in so far! The bottle comes nicely packaged in a large, sturdy cardboard box and with plenty of foam padding to protect your new ink. The bottle itself is even prettier than the box it comes in, the long, rectangular shaped glass bottle has a very stylish ribbed design around the edges. 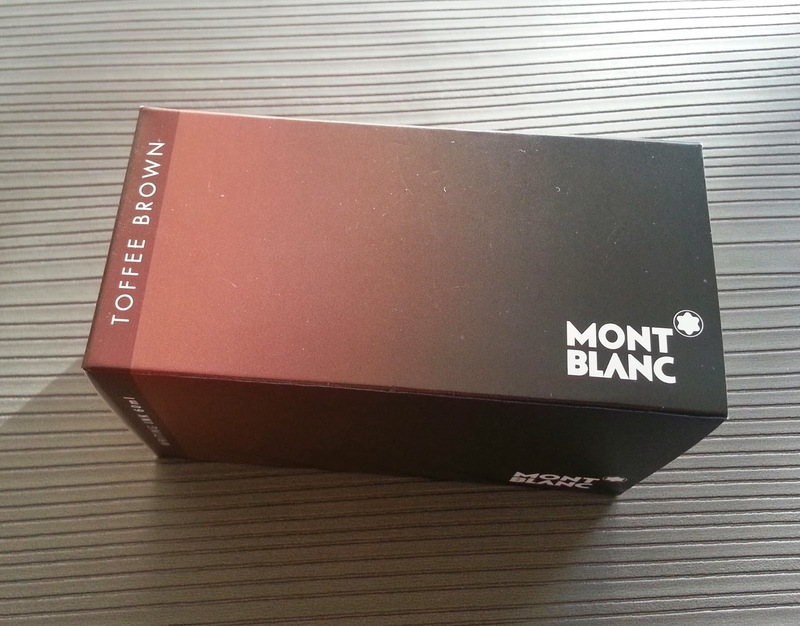 The cap is wheighted with a metal ring and has the distinctive white Montblanc star on top of it. I think this is definitely one of the prettier ink bottles I own, which makes it a great gift (to yourself :-) But not only is this bottle pretty to look at, it's also functional, with a smaller compartment in the front that makes filling your pen easier when the bottle is almost empty! But enough rambling about the packaging, let's cut to the chase! 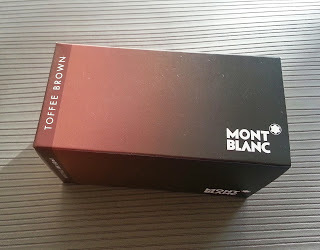 Toffee brown is a very nice saturated, soft brown ink. It isn't very dark, though it has some serious shading, making it appear a bit darker than it actually is! 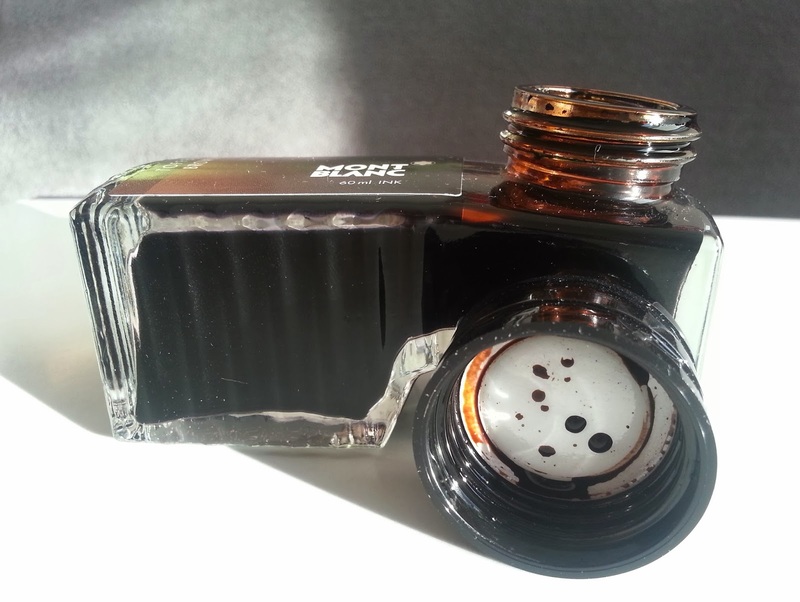 It's a very smooth ink with a wet flow in most pens. It dries quite fast, considering the wet line it puts on the paper. I have had little to no trouble with hard starts or skipping, even with the 1.5mm stub nib I used for the written review! 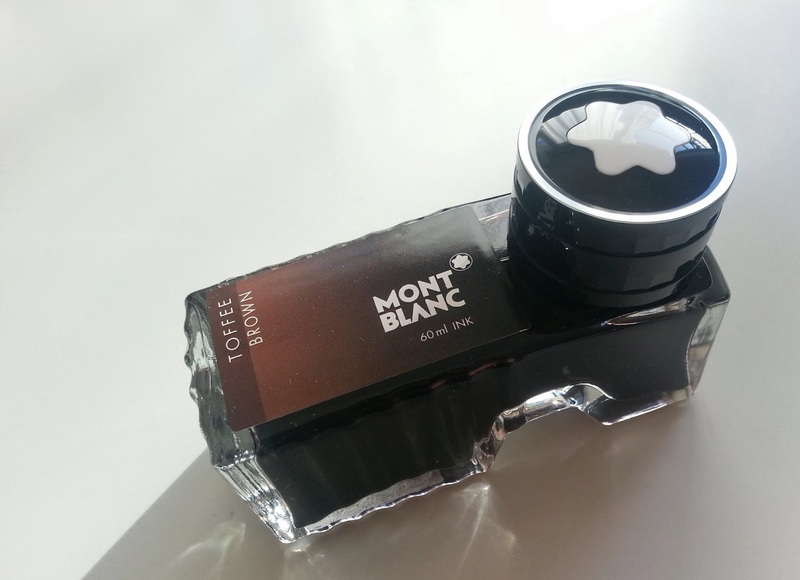 All Montblanc inks come in a 60ml bottle, at a very reasonable price, 14 Euros/ 17USDollars will get you a bottle. wow, I love your new header! and that ink looks kinda.... yummy o.O I mean, for pen-addictives! Have nice holidays and a happy christmas!